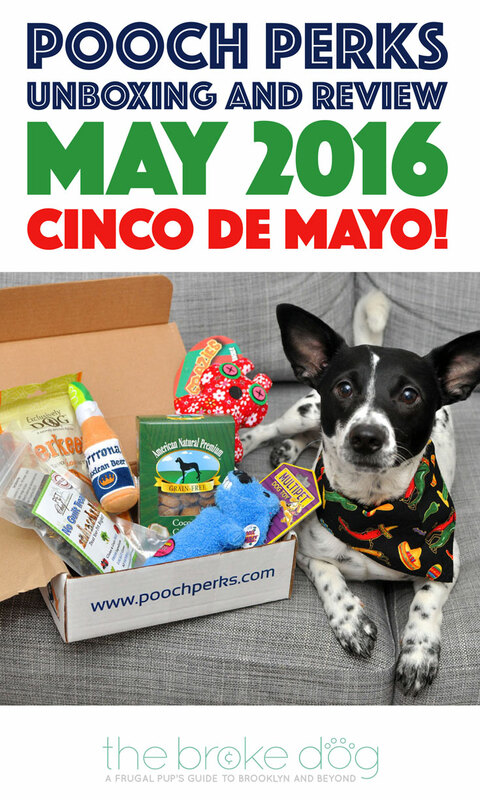 Pooch Perks Unboxing and Review: May 2016 Cinco De Mayo! Disclaimer: We are monthly reviewers and affiliates for Pooch Perks. We receive a free box each month and receive a small commission each time a plan is purchased through our links. We absolutely LOVE Pooch Perks and always give our honest opinions in all reviews! Happy Cinco De Mayo! Even if you don’t remember which event this day commemorates (the Mexican Army’s victory over the French at the Battle of Puebla in 1862, for the record), you might be celebrating today with some strong drinks and delicious food. Well, thanks to Pooch Perks, you can include your dog in the fun! 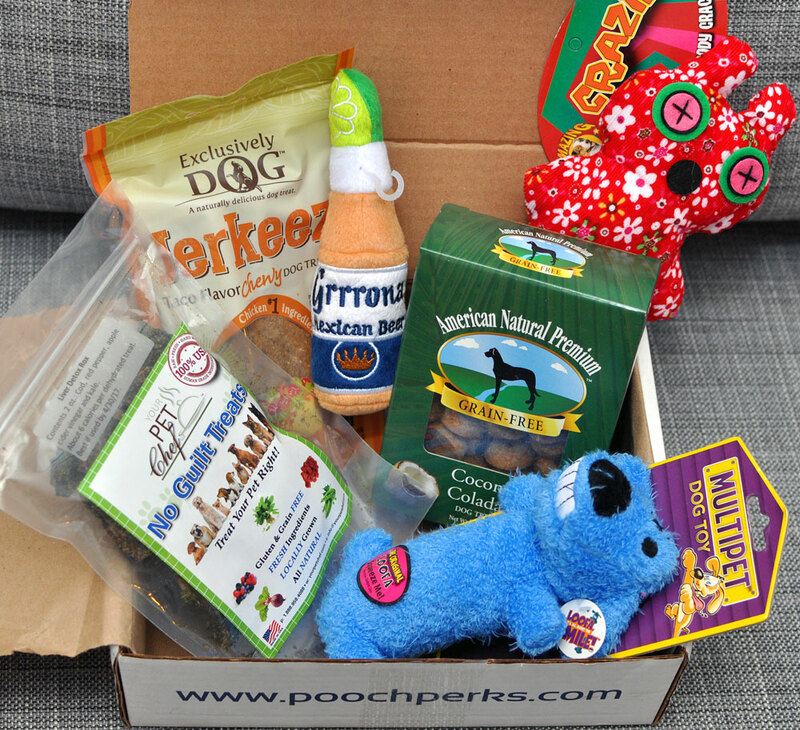 Check out this month’s Pooch Perks unboxing to see how Henry will celebrate (as well as recover from) tonight! This bandana was one of the first things I saw when I opened our box, and I’m pretty sure I squealed. There are DANCING CHILI PEPPERS on this banana! How can you resist? My one chagrin is that there is really only one holiday for Henry to wear this. Guess I’ll have to plan some taco nights! 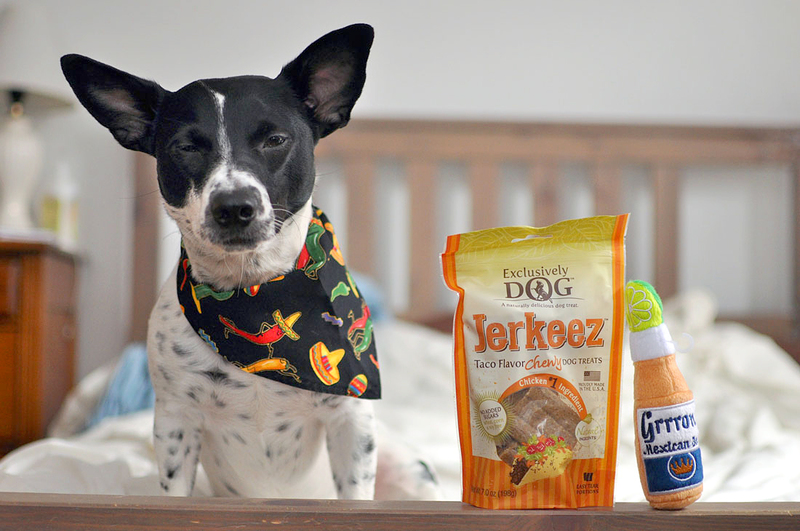 I’ve never heard of taco-flavored dog treats, and I don’t think Henry has either – when I gave him a taste, he looked confused while he chewed. As soon as he finished chewing, he wagged his tail and started performing his “spin” trick in an attempt to get some more. 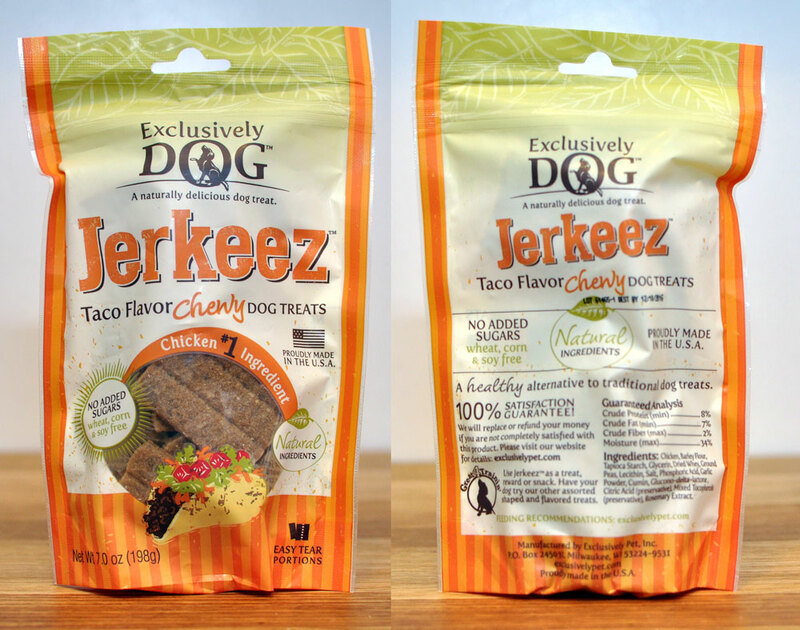 These treats fit perfectly in the theme and chewy treats are always a huge hit in Henryland. Plus, I love that they’re wheat, corn, and soy free and easy to break into small pieces for training! The card that came with the box suggests that these treats will “help you detox after partying like a rockstar.” It wasn’t too long ago that I was a college student, and I certainly knew some people who would have benefitted from something like this! 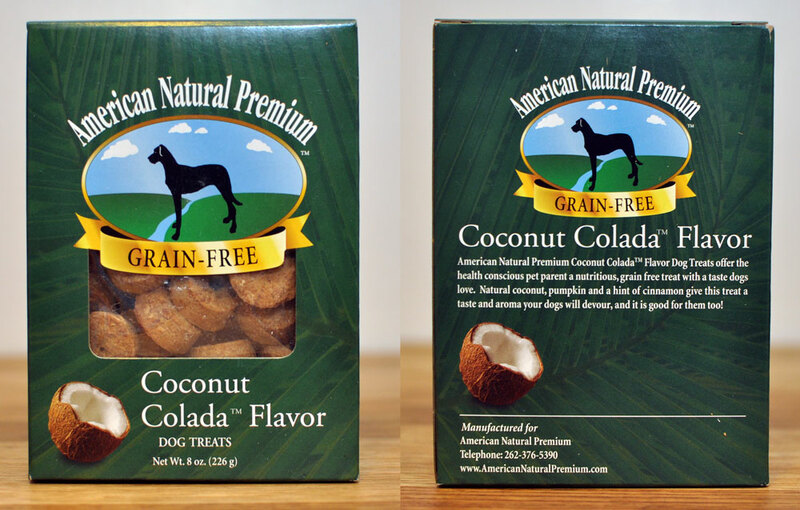 These treats are made in the USA from healthy ingredients like cod and kale. 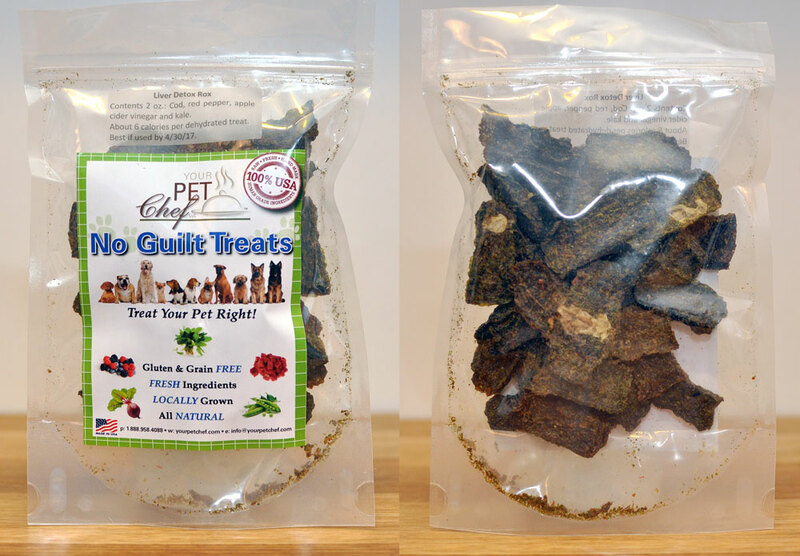 Henry adores the Pet Chef beet treats we received in our February Pooch Perks box, and these were a big hit with Henry as well! These treats make me think of tropical breezes, blue waters, and fruity drinks that pack a punch. Plus, they’re grain-free and contain one of Henry’s favorite ingredients: PUMPKIN! When I offered him one to try, he ran off to his “You Can’t See Me” Spot (Spoiler Alert: Yes, I can), chomped it into a dozen pieces, and licked every last crumb off the floor. I guess that’s his equivalent of slurping up every last drop of a Pina Colada. This dog needs to introduce me to his orthodontist because that smile is FABULOUS! (I wrote that, and then realized that the had a tag on it that said “It’s all about the SMILE!” Multipet, your marketing is officially successful.) Squeaky, furry, tossable – Henry is going to LOVE this. Henry and I absolutely loved this Pooch Perks Pampered Pooch box! It was a great combination of accessories, crunchy treats, soft treats, and toys and almost all items fit the theme perfectly. Henry would have probably enjoyed a chew like a pig’s ear or bully stick, but other than that, the selection was really great. Since Henry doesn’t destroy toys, we probably could have used one fewer stuffed toy – but that just means he’ll be able to enjoy this box even longer! Pooch Perks is available in plans that start at $20 a month, making this an affordable and fun way to save some (refried) beans! Use our code BROKEDOGBLOG to take 10% off any time. Click here to order!